Posted on 20, January 2016 by EuropaWire PR Editors | This entry was posted in Automotive, Germany, Law, Technology and tagged "gas-powered vehicle", Carl Benz. Bookmark the permalink. STUTTGART, 20-Jan-2016 — /EuropaWire/ — It was the document that set the world in motion: on 29 January 1886, Carl Benz applied for a patent on his “gas-powered vehicle”. This was the day the automobile was born. Later the same year, independently of Benz, Gottlieb Daimler built his motorised carriage. Thus it was that 1886 marked the beginning of the so far 130-year-long success story of Mercedes-Benz. Stuttgart. The birth certificate of the automobile bears the number DRP 37435. For that was the reference under which the patent on a “gas-powered vehicle” filed by the Mannheim engineer Carl Benz on 29 January 1886 was registered with the German Imperial Patent Office in Berlin. The 130-year-old document is testimony to Carl Benz’s innovative spirit, creative power and entrepreneurial vision. Since 2011, the patent document has been part of UNESCO’s Memory of the World Programme, which also includes the Gutenberg Bible, the Magna Carta and Johann Sebastian Bach’s Mass in B Minor. Carl Benz developed the world’s first automobile in 1885. To do this, he installed a high-speed one-cylinder four-stroke engine (954 cc displacement running at 400 rpm with0.55 kW/0.75 hp output) horizontally in a specially designed chassis. The top speed was 16 km/h. This three-wheeled patent motor car was an absolute world first: a totally self-contained, self-propelled vehicle powered by an internal combustion engine. The patent motor car made its first public appearance on 3 July 1886 on Ringstrasse in Mannheim. Yet it was the long-distance journey from Mannheim to Pforzheim and back in 1888 in the improved Model III patent motor car that was to fully demonstrate the automobile’s suitability for everyday use. That journey was undertaken not by Carl Benz himself, but by his wife, Bertha. In a show of utmost confidence in her husband’s invention, which had been filed with the Patent Office on 29 January 1886, Bertha Benz was accompanied by her sons Eugen and Richard – entirely unbeknown to the inventor – as she took to the wheel on this first long-distance journey in the history of the automobile in August 1888. Bertha and her sons thus proved how well the concept of a motor vehicle worked at the technical level. At the same time, they gave a practical demonstration of the today still typical application of a passenger car. This was set out by Carl Benz in his patent application when he referred to the “operation of mainly light carriages for the conveyance of one to four passengers”. In 1886, the pioneering inventions of Carl Benz and Gottlieb Daimler brought a revolutionary, new dimension to mobility. For the past 130 years, the innovations presented by Mercedes-Benz have built on that accomplishment: in the interests of safety, comfort, efficiency and confidence. With present-day developments in areas such as autonomous driving, intelligently connected vehicles and electric mobility, Mercedes-Benz is introducing the future of the automobile. It was a visionary path on which Carl Benz set out on 29 January 1886 when he applied for a patent on his motor car. Together with Gottlieb Daimler’s motorised carriage, which was developed likewise in 1886, Carl Benz’s patent motor car is the first exhibit on view to visitors as they begin their tour of the Mercedes-Benz Museum. The Museum celebrates its tenth anniversary in 2016, having to date attracted over seven million visitors. 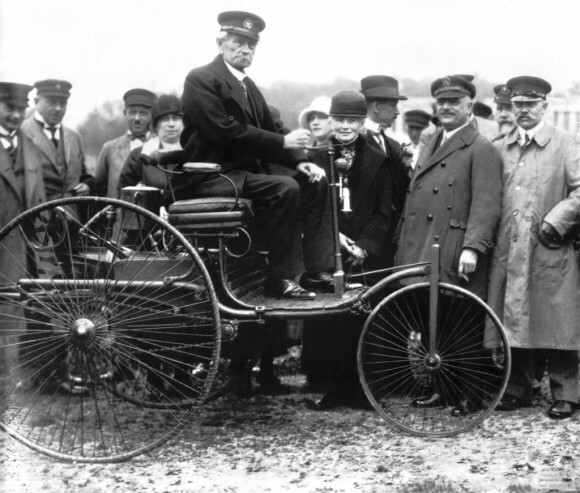 Carl Benz in his first Model I patent motor car from 1886, taken in Munich in 1925.